Let me begin by providing a disclaimer for the Dining Duder. 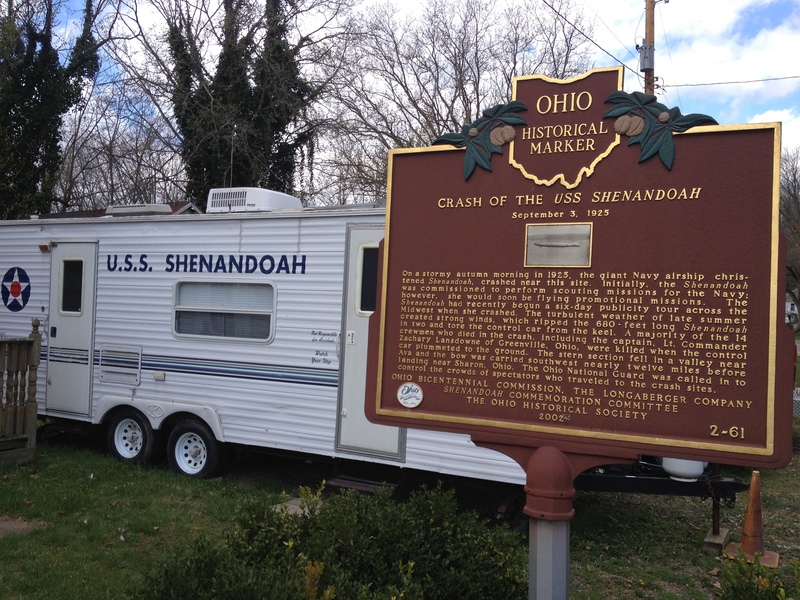 While donuts will be briefly mentioned in this post and they were sampled, this is not an additional installment as part of the Ohio Donut Trail Series. 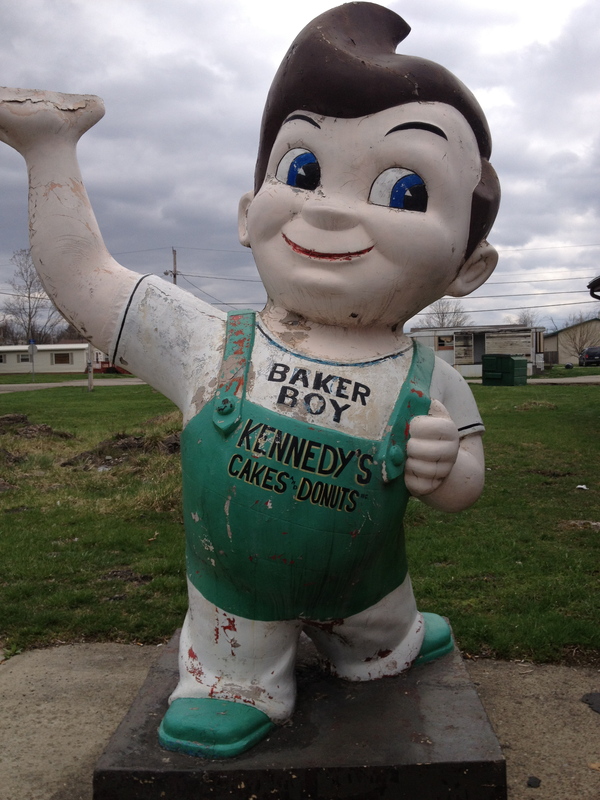 There are two bakeries with the name Kennedy in Cambridge, OH. One is located in downtown Cambridge and looks like a classic small town Ohio Bakery from the 1920’s to 1940’s. I thought that was on the only one. I was wrong. While on my way to the 25th Annual Ohio Bigfoot Conference, I happened to drive by the other Kennedy Bakery while looking for an ATM. Looking at the exterior, I wondered if it was an abandoned building or a converted flea market, but curiosity got the best of me as is my nature, so I pulled into the gravel driveway to investigate. Based on the locations having different websites and my intuition, I do not think the two Kennedy Bakery locations share anything other than a name, at least in the present. I was still not convinced this was an actual bakery. Through the windows I could see many things that did not look like baked goods. However I saw this (see below) and decided I would venture inside anyway. Against the better judgement of my Designated Diner for the trip I proceeded through the door. Afterall, only thirty minutes earlier we had visited Donald’s Donuts in Zanesville so other than exploration, there was no need to dine on more donuts. 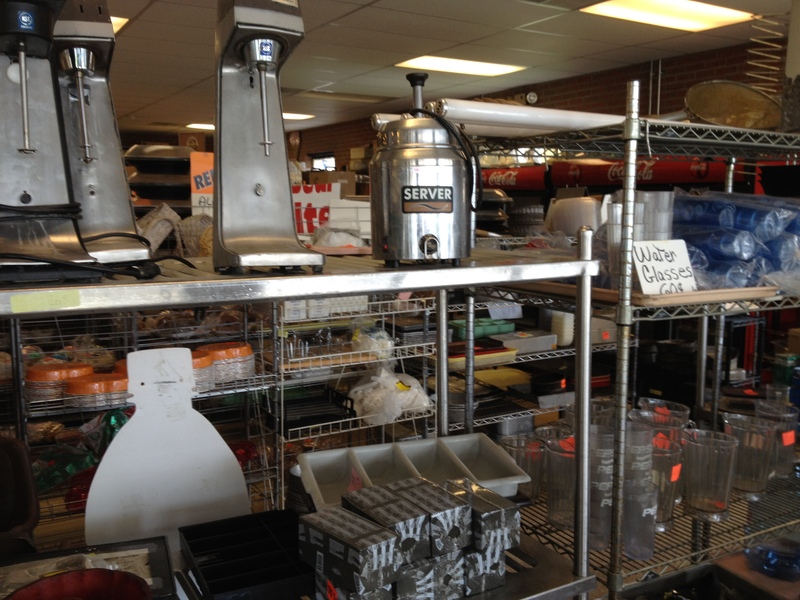 Walking in, I spied a lot of used restaurant equipment on shelves. 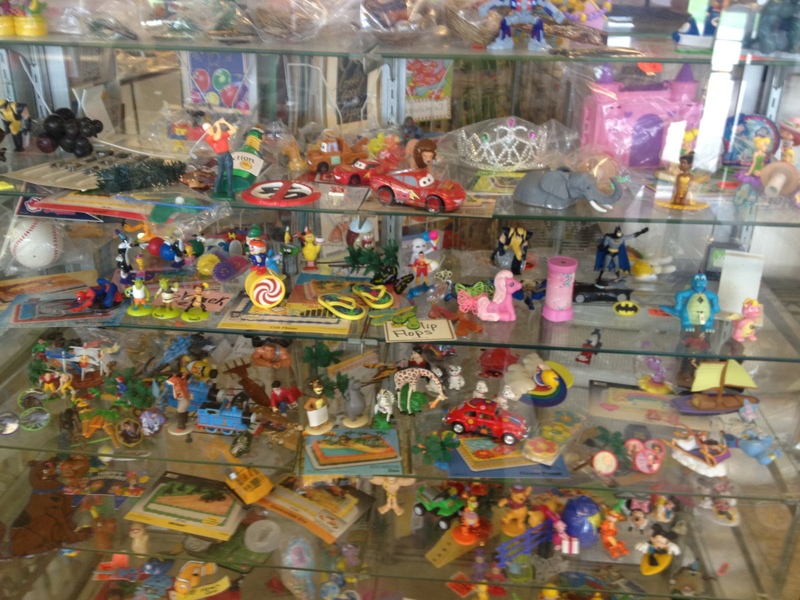 Then I saw display cases of McDonald’s Happy Meal Toys and others similar trinkets. If the old Hobart mixers on the floor had not caught my eye I would have done a quick about face….but then, I saw a man walk out with an overflowing box of buns. I headed opposite the direction he was going and found shelves of discount baked goods (some looked like they might be from Valentine’s Day or Easter). At this point, I continued on. Walking by more showcase encased Happy Meal Trinkets, I finally found the Bakery part of the building. Having visited a few too many bakeries in my day, I can say that the length of area that the display cases of baked goods at Kennedy’s is more expansive than anything I have encountered in my days. However, I was hindered by a couple or more circumstances. I was saving my $22 of cash for the Bigfoot Conference. The Designated Diner continued to look at me with the expression of “Oh my god I can’t believe we are in yet another donut place after having the best donuts of my life at Donald’s Donuts what is this dude’s problem.” In emoticons that would be written as :-(crap. And, I was not hungry. Not in the slightest. What was a fella to do? Then the game changer happened. I saw a sign that said: Pepperoni Rolls and Meatball Rolls. Press on young Gourmand. Press on. Walking back and forth looking at the displays at Kennedy’s it is quickly confirmed that this is indeed a “Full Line Bakery”. Among the items noted were: cookies, cakes, pies, Gingerbread Houses, various breads, bagels, donuts, fried pies, giant blue fish shaped cookies and on, and on, and on. A few donuts were purchased. There were no fewer than twenty varieties to choose from, including some infrequently witnessed flavors. There was a small sample tray for trying bites of donuts. Later in the parking lot, we did try a few and they were respectable, not Ohio Donut Trail noteworthy, but respectable. I was most intrigued by the Raised Glazed donut. Interesting, very interesting. I pressed on. Then my attention was caught by a sign for Paczki. Huh? What is that you might ask? It is a Polish pastry in the spirit of a donut but not quite a donut. In one of the most lightly populated counties in the fair state of Ohio. In an area not cited for a large Polish population or enclaves of Poles and possibly, not so open to diversity in general, this place had Paczki. 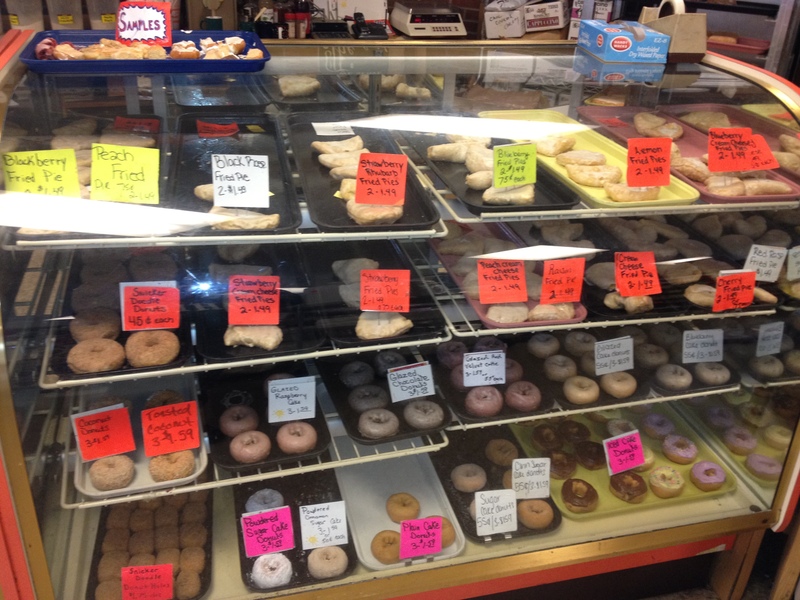 Not just one variety but six….maybe more, the place is big, there could have been Paczki hiding anywhere. And then I saw the sign. In my head I heard (I don’t often hear voices, but when I do they are always in an accent), in the style of DeNiro. You want Paczki? I’ll give you some #*^%$#* frickin’ Paczki. I did not try one. I was too full. I continued on and found the pepperoni rolls. One was purchased and then sampled by myself and the Designated Diner. The DD has only had one pepperoni roll ever and that was from Omega Bakery at North Market so this entry stood no chance. I have consumed a much wider range of the Hillbilly staple so I was inclined to evaluate this pepperoni roll on the wide spectrum of the genre. It was wretchedly horrible. I had hoped that the proximity to West Virginia might add a certain terroir to the pastry, but alas no. There is another shout out I should give this place in the arena of full line bakery. Some of you who grew up as one of the 99% may be familiar with the staple of McDonald’s and Hostess (RIP? ), the fried pie. Rarely seen outside of a fast food franchise, Kennedy’s had enough to feed a small army or militia. 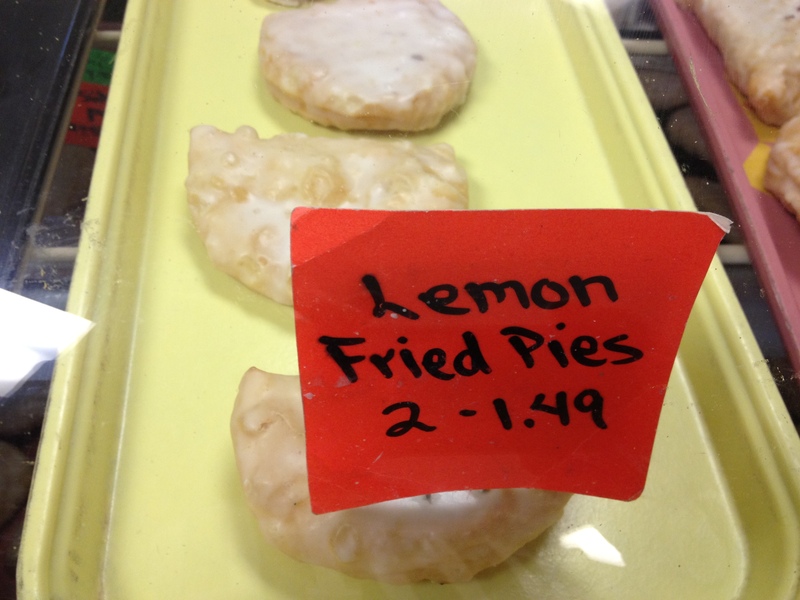 The flavor choices of the fried pies was more extensive than the Paczki’s (at least fourteen flavors counted) including lemon, peach and blackberry. 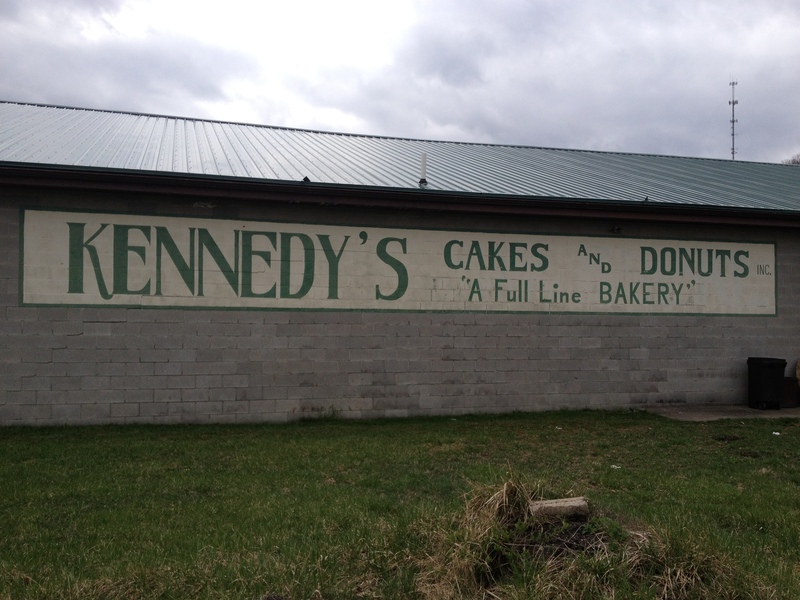 I would be interested to see what the Kennedy version of short line bakery would offer. My final thoughts? I did not sample enough to know if this is or is not a place I would want to go. I can say, it is not just a bakery, it is an adventure. And now, for the first time ever, a new feature: “When Blogs Collide”. Near the bakery, in an overgrown lot, located in a pile of rubbish, I found this. Will I go back? I think so. Why might you ask? First to try a fried pie and second because in addition to offering what seems like 1001 types of baked goods the place has over 1 million milkshake flavors. Bonus Content: What happened after the bakery? Being unable to get into the Bigfoot Conference because it was sold out, it was decided to drive a mere 100 miles away to Athen’s to dine at O’Betty’s. Along the way we attempted to visit the Shenandoah Museum (closed), attempted to find the Shenandoah crash site (secretly hidden in the area I believe Deliverance II will be filmed in), stopped at Marietta Brewing Company for a root beer, found an Indian Food Truck from Parkersburg serving students in Marietta and finally dined at O’Betty’s – the best hot doggery in Ohio. And you wondered why the Designated Diner would ever glare at me with a :-(crap. This entry was posted on April 18, 2013 at 8:12 PM	and is filed under bakery, Ohio, Road Trip, Travelfoodalogue. You can follow any responses to this entry through the RSS 2.0 feed. You can leave a response, or trackback from your own site. I do some work occasionally for the Guernsey CO Sheriff, whose offices are right down the road, and have tried them before. The pepperoni rolls actually aren’t too bad for an inexpensive quick lunch.